They are said to alter your mood and perception, bring about deep awarenesss and unite the layers of the physical, mental and emotional body together. They can be used in conjunction with asana, meditation and pranayama and even in classic Indian dance moves. 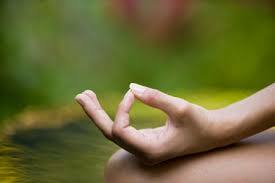 There are five groups of mudras: hasta (hands), mana (head), kaya (postural), bandha (lock), adhara (perineal). The more commonly practised being hasta or hand mudras. Our hands are very powerful instruments and are thought to be a map of our consciousness and contain our physical and energetic body’s blueprint within them. Each digit relates to a Universal element and its corresponding energy: the thumb is fire, index finger is air, middle finger for ether/space, ring finger for earth and the little finger for water. And by performing certain mudras, you bring these elements into balance in the body and connect to the Universal flow. Some people believe that when you are in a state of Universal flow that you can be healed of disease of the body and can attain enlightenment. Mudras are best practised when they are held for a few minutes (for beginners) to sixty minutes (for more seasoned practitioners). Prayer position of the hands, is probably the most common and familiar mudra. It is believed to bring balance back to both sides of the brain and body (the masculine and feminine sides or nadis) and centre the mind and bring an awareness to your heart centre. You may also be familiar with chin mudra, where the thumb and forefinger are joined, forming a circle and the rest of the fingers extended outright. Placing the back of the wrists on the knees in a sitting meditative posture helps to open up the diaphragm and encourage deeper breathing, which increases the flow of prana. Chin mudra, is a gesture for consciousness. By flipping the hands so the inside of the wrists rest on the knees, this is a gesture for knowledge and receptivity, known as gyan mudra (also known as jnana mudra). It is also great for enhancing concentration, clearing the mind and relieving depression. Gyan mudra has a more grounding effect whilst chin mudra, helps you to connect with a higher source. Mudras may even be able to heal or alleviate certain ailments in the body. Here is a comprehensive list of mudras that correlate with bodily ailments. (Please always consult a health professional first). You can practise mudra at any time but next time you practise asana, be aware of the mudras that you are experiencing and how the deepen your practise.